And it is a joy. Cooking takes a back seat to being a father. If I have to cut some corners so I can finish a bit quicker, then so be it. Every now and then I find some time to make a nice meal for Lauren. After all, she spends far more time with Dominic than I do. Don’t get me wrong, the little man has my full attention when I’m not in the kitchen, and I do what I can to alleviate some of the load for Lauren. Having a nice meal is a great way to say thank you. That’s what comfort food is all about. People always gravitate to comfort food after a hard day’s work because it relaxes you for those ten minutes of indulgence. And this meal isn’t exactly comfort food, at least not in the traditional way that meatloaf is, but it’s pretty close. Lauren loves comfort food. In fact, I think she has asked me several times in the past few weeks for meatloaf, and for some reason I have failed to deliver. I promise I’m a good husband most of the time. So how do you tell someone thank you for all that hard work? Make’em a nice meal. Make’em comfort food. Or if you’re like me, make’em comfort food with a twist, like pork chops and applesauce (pronounced “pohk chawps ‘n applesahhhs”). This one’s easy. Wrap the pork in bacon, and use kitchen twine to secure the bacon to the pork medallions. Season the top and bottom generously with rosemary, pepper, salt, and garlic. Heat a medium frying pan to medium-high heat. Add olive and cook the medallions on one side for five minutes. Turn and cook for another five minutes on the other side. Remove from stove and place in oven. Let cook for 5 minutes. Remove from oven and let rest for 5 minutes. Watch how hot your stove burns. You might need to adjust the heat and the cooking time. The one thing you don’t want is to dry out the pork. All proteins will become terribly dry when overcooked, but pork and chicken are the worst culprits. Sometimes beef is a little forgiving, and while fish will also easily dry out, it’s one of those proteins that is easier to gauge when finished. I’m convinced that gravy was discovered because someone didn’t know how to properly cook meat, so in order to mask the dryness, the cook covered it with sauce. What a wonderful invention! Gravy is both delicious and useful for fixing those cooking mistakes. Random side note: potato chips were also an accident. A customer continually complained about the thickness of his fried potatoes, so the cook cut the potatoes as thin as possible and quickly fried them just to make a point. Potato Chips! That’s the story according to Saratoga Springs, NY anyway. Sometimes kitchen accidents are a wonderful thing. But there’s no gravy here. I love pork chops smothered in gravy as much as the next guy, and I especially love my pork chops a la ketchup (catsup?) just like Mom and Dad used to make’em, but we’re being nontraditional here. Depending on the thickness of the medallions, they should be just right–no sauce necessary. Peel the apples and potatoes (save the apple peels for later). Shred the potatoes and apples using a cheese grater or food processor. Be sure not to shred the cores and seeds and keep the apple shreds separate from the potato shreds. Heat a large skillet to medium heat and melt butter. Add the potatoes and season with salt. Stir occasionally to avoid clumping and sticking to the pan. In a small mixing bowl, combine lemon, honey, brown sugar, lemon zest and whisk well. Once the potatoes start to brown and become tender, add the apples and lemon-honey mixture. Stir to combine all the ingredients in the skillet and cook for 2-3 minutes (the apples do not take long to cook, and you want the apples to maintain some crunch for texture). In a 1 quart reduction saucepan add all the ingredients. Stir well. Bring the mixture to a boil, and then reduce to medium and let simmer for 10 minutes. Reducing liquids can be tricky. It’s all about the consistency. How thick do you want the sauce? Ideally, you want to reduction to coat the back of a spoon, like cough syrup. The problem is, when the reduction is hot, it’s still very runny, so it’s hard to tell what the consistency will be like when it’s cool. Watch for how much liquid has evaporated out. I would reduce the liquid down to a fourth of its original size. If you want a syrupy consistency, which is what I like, then aim for 1/4 the original liquid. But, if you want a runny reduction, then reduce it to half the original liquid. Be careful. If you boil this down too much and too fast or too hot, then you will ruin the vinegar and you’ll have to start over. Honestly, I’ve messed up my fair share of reductions, whether it’s balsamic vinegar or some other reduction I was working on. In fact, just the other day I was making a pomegranate reduction for creme brulee and had to do it twice. You can’t be afraid to mess up in the kitchen. Remember, sometimes kitchen mistakes create something wonderful (think potato chips). The picture at the top of this blog says it all. Start by placing the hash down on the plate. Remove the twine from the pork and place one medallion directly over the hash. If you have a squeeze bottle, then funnel the balsamic reduction into the squeeze bottle and make any design you’d like. 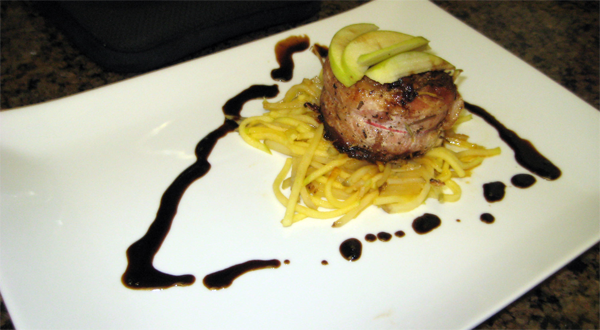 If you have some spare apples, cut a few thinly sliced wedges and place on top of the pork medallion. If not, use a spoon to drizzle the reduction around the plate and serve. Don’t forget to try new twists on old favorites. Don’t forget it’s OK to mess up. And most importantly, don’t forget to say thank you to those you serve. Lauren deserves a great meal, and so do all the people you love too.